"Pic of the day. Here's Beat! And Plant Barrier!! These are some of Mega Man's custom special moves. You might also be able to use some signature boss-like moves from the Mega Man series, too." As explained in an earlier update, "each fighter possesses four special attacks; standard special, side special, up special, and down special. Each of these can be customized, however, so there are three variations for each direction. This means there are two classifications for special attacks: basic and custom." Question is, what other "signature boss-like moves" (or support characters) can we expect? Board the speculation train and sound off in the comments below! I'm reckoning Shadow Blade to replace Metal Blade in custom .. it makes too much sense! I'm kinda wondering if they'll go obscure enough as to include Tango somewhere as well.. Beat carried Rockman's head ? Too odd to me. Look at Rockman 7, he carried Rockman's shoulders instead. Yeah, seeing this makes me hope for the helmet not going off. The helmet nearly never goes off, or is nearly as flimsy as the Archie comics make it seem. Which, they seem to want it to come off after every little touch. 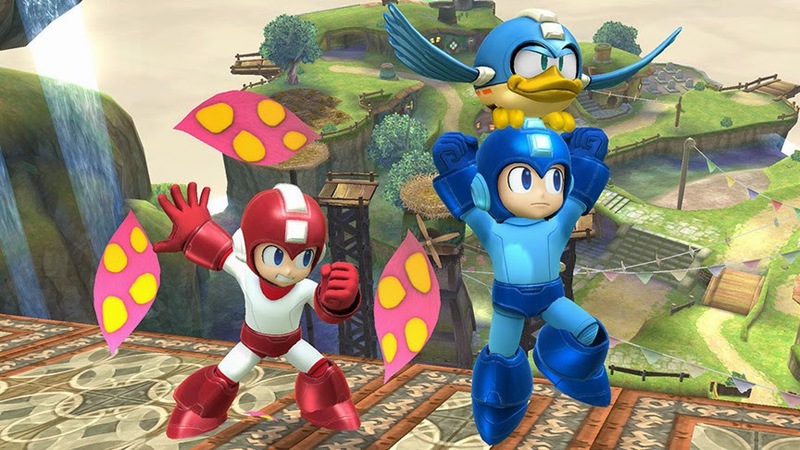 Given that this version of Mega Man for Super Smash Bros. 4 is heavily based on the NES version of the character, it doesn't surprise me that they are sticking close to it to a tee. Though I do hope that Mega Man's weapon variations will expand beyond the NES games, though. I want a skull shield as an option.